When you are in charge of the management of a project, it is important use a Project Management Checklist to remain organized and to keep track of the various tasks involved within the project. Not only is it important to keep track of the tasks themselves, but it is equally important to keep track of progress that has been made while maintaining awareness of the deadlines with a Project Management Checklist. Project Management Checklists are essential for successful completion, and having a well detailed to-do to keep track of the projects’ elements is vital. The template helps to spell out in plain language the necessary details that are needed and is easy to use. The Microsoft Word Template is available for download for free on this page and it delivers a personalized product that will make it easy to get all of the tasks done. First, insert the name of the person or person who are responsible for completing the tasks outlined on the to-do list. 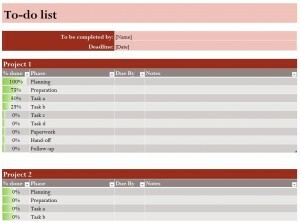 Second, complete the deadline field with the date that all of the tasks are needed be completed by. Third, fill in the individual tasks in the fields in the phase fields. Each project can be broken down into a total of 9 phases that may need to be completed. complete details that explain the purpose of the field trip. The template already designates the planning, preparation, paperwork, hand-off and follow up phases, but it also allow 4 additional fields for additional phases that may involved in the project. Fifth, include any notes or special instructions that may be needed in order to complete each task within the projects. The drop down menu allow for easy organization, and can be used to sort the information in accordance to your needs and desires. Sixth, repeat the previous steps for each project on the to-do list. Lastly, as the tasks and projects are completed, use the drop down menu to select the percentage of completion. This will assist with keeping track of uncompleted tasks and easily assess the amount of work that is needed in order to complete each task. The drop down menu also allows you to prioritize assignments by sorting the tasks in order by the level of progress marked next to each task. Second, be sure to continuously update the Project Management Checklist when each phase is completed. This ensures that the Project Management Checklist remains updated and accurate.